Located on the site of the former Walthamstow Dog Stadium, L&Q’s Stadium Place is a landmark affordable housing development for east London, offering 99 one to four bedroom, shared ownership apartments, townhouses and maisonettes, plus 95 affordable rent and 99 private rented homes. Revitalising a disused and neglected area, the exceptional new development was designed by multi-award winning Conran & Partners and HTA Architects. It offers a uniquely wide variety of affordable accommodation in an historic setting, alongside first class facilities for the community. 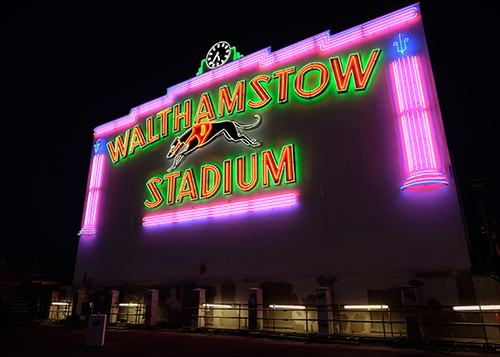 The project includes the faithful restoration of the Grade II listed former stadium’s art deco façade, and the complete refurbishment of London’s largest wall of neon. This ground-breaking scheme has received praise from Historic England and attracted the attention of national and broadcast media – restoring an iconic and well-loved east London landmark, as well as creating an aspirational environment for first time buyers.